The shingles are in place thanks to another quality job by Chewy and Teo Roofing! 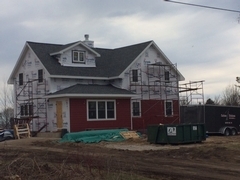 The siding is now being put on with the owners deciding to stay with the red siding and white trim which the farmhouse has been for many years. This compliments the red barn and really ties it all together. More pictures to come with the siding is complete.